We are watching the mini series, produced and directed by Tom Hanks – “From the Earth to the Moon‘ – the wonderful reenactment of the Mercury, Gemini and Apollo flights of the 60’s – in the effort of the ultimate goal – to land a man on the moon. I love Kennedy’s speech in the intro – it is both moving and emotional every time I hear it. And after he was assassinated – it became the goal of every one in government and at NASA to make sure that his wishes were carried out by the end of that decade – and they were. In one sequence the man in charge asked another man – ‘Can we do this?” That indeed was the question. The reply, ‘Yes. We have to’ – and they did. It’s amazing to us to watch this drama unfold before our eyes – stories taken from things that really happened. In a day and age before the internet – fancy state of the art equipment or the facilities that make them. Technology that was decades before its time – all because they felt compelled – they had to do it. ‘Not because they are easy, but because they are hard’ became the battle cry of the sixties – for the space program and every astronaut and those working behind the scenes to make it happen. It is fascinating. It shows what can be accomplished when the human mind and heart is challenged and has the right leadership to make sure that it does. It also shows what a little competition can do for the human spirit – and we wanted to BEAT RUSSIA to the moon – plain and simple. And so we pressed on and had the most brilliant minds working on it – until finally in July, 1969 – we accomplished the task – a man on the moon. This story is one we will tell our grandchildren about and they will tell theirs. Even now it seems unlikely and impossible that we actually had the technology to do this – and yet – we did. Unbelievable and Extraordinary. It makes me SO proud to be an American. Where were you when a man landed on the moon? I was 8 years old – watching it on a TV in my parent’s home – although I must admit – looking back on the events I am a bit fuzzy on them. It was years later that I learned that the actual ‘moon landing‘ happened in the summer – in my memory I was sitting in my classroom at school with my chair turned to face the back of the room where the ‘mobile’ TV was wheeled in. We all watched in hushed wonder as the first man stepped onto the surface of the moon. I don’t know why I remember that – it might have been a recording from the actual event – given to our school so the classes could watch it again – I’m not sure. But that is where I will always remember the wonder of it. I still look up into the sky at night and think to myself, “Wow – we really went there.” It’s amazing to me. Still. 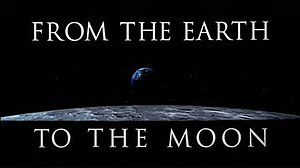 Below is the intro for “The Earth to the Moon” – I double dog dare you NOT to get a little choked up when watching it.